An Arab Woman Blues - Reflections in a sealed bottle...: A Snapshot of Iran's Role in Igniting Sectarianism in Iraq. A Snapshot of Iran's Role in Igniting Sectarianism in Iraq. 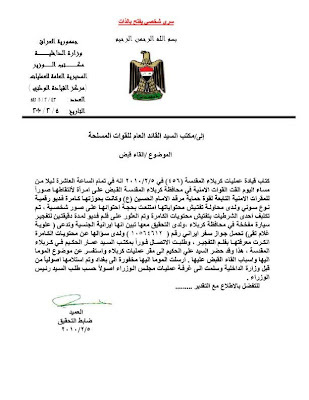 I just received a copy of this leaked confidential official Iraqi memo addressed from the ministry of Interior to the commander of the armed forces. I will translate it for you. It will give you an insight into Iranian operatives in U.S occupied Iraq. The head of the Kerbala operations, informed us on 5.2.2010 that at 10 pm the Kerbala security forces arrested a woman taking pictures of the security posts responsible for the protection of the Imam Hussein shrine. She had in her possession a Sony video camera. When they tried to search her personal belongings, she objected, claiming that these were personal photos. A policewoman was called in, to conduct the search. She found a 2 minute video film of a car bomb explosion that took place in the city of Kerbala. Subsequent interrogation revealed that this woman is an Iranian national, by the name of Alwiya Ghalam Taki -- holding an Iranian passport-- number 10564612. When asked as to the contents of her camera, she denied knowing anything about the filming of the explosion. She then requested the immediate contact with the bureau of Sayyed Ammar Al-Hakeem (head of ISCI) in Kerbala. Sayyed Ali Al-Hakeem came to the security operations office of Kerbala, inquiring as to the reasons for her arrest. A memo was then signed for her release, a copy of which was sent to the minister of the Interior in Baghdad and another copy to his unit of operations, as per the minister's order.